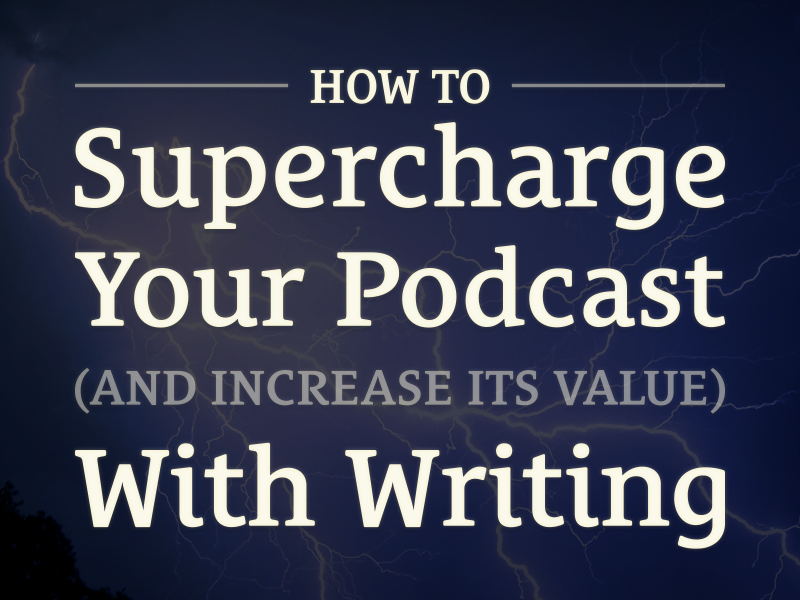 This week I’m joined by special guests Sean and Laci McCabe to talk about how to supercharge your podcast with writing. I’ve seen how much value listeners get from the show notes for the seanwes podcast, so I wanted to bring Sean and Laci on the show to talk about how to find topics for episodes that will resonate with your listeners, and how to write show notes full of valuable information that will help grow your audience. In the first half of this episode, Sean shares tips on how to finds topics that resonate with your audience, and how to prepares for episodes by writing outlines. In the second half, Laci – who is now the full-time show note writer for seanwes – shares her tips on writing show notes after the recording stops. This episode is jam packed with great tips about how to use writing to make your podcast better. I hope it inspires you to take a little more time to prepare for your shows and invest time in writing great show notes that stand alone as valuable posts that your listeners will love and share with other people. Let people come up with topics for you. Make them feel like you’re reading their minds by answering their questions. If you don’t have an audience, go where the conversations are happening. Find out what people are struggling with and answer their questions on your show. Save questions and topic ideas in a text document or to-do list app. Script enough to have structure but not so much that you smother spontaneity. Imagine the person reading your show notes never listens to the episode. What takeaways and highlights can you give them in written form? You can repurpose written content for other mediums. It all starts with writing. Show notes don’t have to be an exact transcription. They can be a hybrid of transcription and blog post. People will see you as an authority if you write or podcast about a topic consistently. This is 1 of 10 sample episodes of this show made available for FREE. Get access to hundreds more like it when you sign up for a seanwes membership. Access mini courses with audio, video, and written lessons that will take you from zero to sustainable business. Tune in to live broadcasts every week day, and connect with other like-minded people across the world who will give you the feedback and accountability you've been craving in the Community. 2:54 Aaron: The most important thing to think about is starting with the takeaway in mind. A great podcast episode has at least one takeaway. I love learning, so a perfect podcast for me is one that tells me right away (either in the title or the description) what the episode is going to be about. We’ll call that the takeaway. 3:27 Sean: So for this episode, the takeaway is a two part look at using writing for podcasting; how to prepare an outline for the episode, and then when you’re done recording, how to turn that outline into show notes. 3:53 Aaron: Depending on the structure of your show, the takeaway can be a large topic with a few sub-topics, or just a very focused look at a single topic. A 20 minute episode about a single topic can be as valuable as a two hour show that covers a broad range of topics within the context of a larger topic. I’ve found that starting an outline with a takeaway makes me think about the important sub-headlines for the episode; the important things I need to share with people. Over the course of a week, I’m thinking about the topic, writing, thinking, then writing again. 5:22 Sean: I’ve done two shows a week for the past year and a half, but recently, I started doing the Lambo Goal podcast weekly as well, so that’s three shows per week. Coming up with topics is challenging, especially when you’re trying to come up with topics that people find valuable, but the real trick is letting people come up with topics for you. You want people to say, “How do you come up with an episode that’s exactly what I was wanting to learn?” You aren’t going to get that by guessing all the time. You’ve got to ask them. You have to ask them what they’re interested in. Tell them who you are. Explain what they can expect to get from your newsletter. Ask them what they’re struggling with. 7:03 So you’re setting the stage as far as who you are and what they’re going to get from the newsletter, and then you’re asking them what they’re struggling with. They’re going to be eager to share their questions with you, and you can collect those questions and use those as topics for your podcasts. That’s how you create episodes that people will listen to over and over. Your listeners will feel like you’re reading their minds. All of my topics (at least as many as possible) are a direct response to someone’s question. 7:50 Aaron: How do you keep track of all these questions? 7:56 Sean: I use a to-do list app called Wunderlist. I have a category for topics, and I’ll include titles, notes, and any specific questions that I can bring into the show. 8:08 Aaron: So you’ve got this bank of questions and show topics that you update when you get new questions or ideas. 8:20 Sean: We’ve got a question in the chat from Marinda: How do you come up with topics when you don’t have anyone to ask yet? Should you only start a podcast with an existing audience? 8:34 Having an existing audience is great, but podcasting is a great way to build an audience. If you’re not getting those questions from anyone, you need to go out and start those conversations with people. The autoresponder trick only works if you already have people coming to your website and signing up for your newsletter. If you aren’t getting that traffic, go where the people are. Start conversations. Go on Reddit, Twitter, Facebook, or Instagram, and start conversations with people in your niche. Go where the people are and observe the things they’re talking about. Find out what they’re struggling with. If they’re posting about it in a public forum, that’s an opportunity for you to use it as a topic for your podcast. 10:00 Aaron: I collect topics and questions in a app called nvALT. As I’m going through my week, anytime I see someone struggling with something or if someone asks me a question about podcasting or audio, I capture that as a possible topic for a future podcast episode. That gives me a starting point for a podcast episode. 10:38 Sean: The title of the episode is the question you’re answering in that show. You aren’t giving away the answer or solution in the title, make the title something people are struggling with, then deliver a solution in the episode. Start with the takeaway and then flesh out an outline; the steps that lead up to the solution. 12:27 Aaron: I did a lot of writing for my previous episode (How to Edit Podcasts Like a Pro). I spent multiple hours writing the outline over the course of a week, and preparing so much allowed me to focus on doing a great job with my delivery of the content. 13:48 Sean: I saw those show notes, and they were really great. You told me that you had written them before you recorded the show. The outline can also serve as a structure for your show notes. 14:32 Aaron: If you’re doing a solo show, the more you write, the more you prepare, the more confident you’ll feel about delivering your message because you’ve thought it through and written it out. 15:19 Sean: You will need to script more for solo shows, because you don’t have a co-host to chime in. Don’t script out every single word you’re going to say, but make lots of bullet points. You’ll probably get through the list of bullet points faster than you’d expect, so prepare a little bit more than you think you’d need, but do it in bullet form, not word-for-word. 17:01 Aaron: Do you think it’s possible to read a pre-written blog post in a way that makes it sound completely natural? 17:19 Sean: I think you can, but your writing style must be very, very natural. That only comes though practice. It comes from writing something, recording yourself reading it out loud, then listening back and re-writing it to fit your “voice” or natural style of speaking. Repeat that process over and over and your speaking will improve because you aren’t filling space with filler words because you’re reading what you wrote. Your writing will also improve, because you’ll find that some of the things you write aren’t written the way you speak, and it doesn’t sound very natural. Practicing those things will improve both your writing and your speaking. 20:04 Aaron: Laci, what is your previous experience with writing, and how did you get the job of writing show notes for seanwes? 20:16 Laci: I don’t have a background in writing as a job, but I wrote a lot when I was growing up and in college. My grandfather was an author that published a few books, and when I was 11 or 12, I did some editing for his books. My previous jobs had nothing to do with writing, but I volunteered to write show notes for Sean when he decided he wanted to hand off that responsibility to someone else. I had no idea what I was getting myself into at the time. 22:41 Sean: Laci has written over 10,000+ words for certain episodes. That’s insane. 22:48 Aaron: Many podcasters write fairly simple show notes for their podcasts; usually just a description and some links to things mentioned in the show. The show notes for seanwes episodes are much more detailed; they’re part transcription, part blog post, and part e-book. They are epic. 23:25 Sean: We had a great question from Pam in the chat: “What’s the benefit of doing these exhaustive show notes? Is the investment worth it?” Monetarily? No. We’re not making a ton of money from it. It’s about value to our readers and listeners. There are a few ways that these show notes are beneficial to us. First, SEO. If you have a ton of written content on your site, search engines are going to notice. You’re going to show up in Google for all kinds of key words because you wrote them out. 24:41 Audio is impenetrable. You can’t scrub through it like on a video where you can hover over the timeline and see what you’re going to get. There’s no way to do that with audio, so having all of that audio content written out makes it more accessible, not only for search engines, but for humans. 25:20 The other thing is that we have deaf people in our audience. Writing exhaustive show notes allows them to read and enjoy the content. Also, some people prefer to read a blog post instead of listen to a podcast. Maybe there’s a stay-at-home mom in our audience that doesn’t have an hour to listen to the podcast. Something we’ve started doing recently is what we call highlights and takeaways. 26:42 Aaron: Do you start by writing those takeaways and highlights before recording the show, or do those come from Laci listening through and pulling them out? 26:54 Sean: I used to do more of that myself, I would highlight them in the outline, but Laci has gotten really good at knowing what to put in the highlights and takeaways section. We’ve got a good team rhythm going where I don’t have to be super explicit about takeaways. 27:27 Aaron: Like you said, people consume content in different ways. Those extensive show notes are like a standalone blog post, and writing is never wasted time. People will find it later and read it and get lots of value from it. 27:59 Sean: Let’s say someone listened to this episode, maybe in the car or while running. They want to go back later and find certain nuggets without having to listen to the whole episode again. A lot of people that listen to the seanwes podcast go back later and reference things in the show notes. They can do a Google search for the name of the show plus a keyword, and because we do timestamps in the show notes, they can find the place in the episode where we were talking about that thing they searched for. 29:15 Sean: I talked about this on my podcast in episode #139. Everything starts with writing. If you only have audio, you don’t have written content. If you turn that into written content, you can repurpose it. You can copy that content into an email as a newsletter or a one-off response. You can turn it into a video – that’s what I did for seanwes tv. I took my written content and recorded video and put it on Youtube and reached a totally different audience. 30:31 Aaron: In your show notes, you’ve got time-stamps as clickable links that will start the MP3 playing at the right time. How did you set that up? 32:45 Aaron: Laci, what happens after I finish editing a seanwes episode and send it back to you? What does your workflow look like? 33:00 Laci: The first thing I do is listen for the point where they get into the topic of the show. There’s usually around five minutes of chatting before they get into the topic of the episode, so I listen for that point and that’s where I start the show notes. I change time stamps when a different person starts talking, or after about a paragraph. If the same person is talking for a long time, I’ll break that up into paragraphs for readability. I think of the scroll of a screen as a page of a book. I don’t want them to have to read a full page of solid text, it’s easier to read if it’s broken up a little bit. 34:24 Sean: Maybe we should back up and talk about how we do transcripts. A lot of people might think you just write down every word that was spoken, but that’s not how you do it. 34:52 Laci: It’s not an exact dictation of what is spoken. It’s a condensed, readable format of what was said. Using the book example I mentioned earlier; books have dialog, but they’re not all dialog. You wouldn’t want to read 10,000 words of dialogue in a book of dialog, so you want to break that up. 35:55 Laci: Another thing you can do to make your show notes more readable is eliminating verbal transitions. A lot of times, people will start a sentence with “so”, “yeah” or “and”, or use those kinds of words as transitions between sentences or thoughts. I listen to the sentences that are being said and think about how I can rewrite them to make them more readable. 36:56 Aaron: So you’re taking some liberties with how you write what was said. You listen to what the person said, and then you think about how you could re-write it to make more sense or be more readable. 37:11 Laci: Sometimes Sean will repeat something for emphasis. For example, he’ll say basically the same thing three in three different sentences. I’ll condense that into a single sentence so that people don’t have to read repetitive content. 37:33 Sean: There are several things we’re doing when writing show notes. We’re breaking up the sections, adding headers, and designating the people talking, and we’re also pulling out interesting parts of the discussion to use as pull quotes. We do this because some people just skim the content, some are just looking for the gold nuggets, and there are people who will read the show notes all the way through. We want to cater to people at all different levels of engagement. There’s a few ways we do this. First, we tell a story through the headers. So imagine someone only looks at the headers; what is the message they’re taking away? We also give them some of the best takeaways in pull quote format. Finally, we bold key phrases or takeaways throughout the show notes. 38:58 A lot of people will bold text for emphasis. For example, they’ll write, “The thing you really want to do it…” and they’ll bold or italicize the word “really”. When someone is skimming text, the things they’re going to notice are the things that stand out; headers, pull quotes, or bolded text. If you only use bold text for emphasis, that doesn’t tell a story or give your listener a takeaway. I ask Laci, “Would I tweet this? Is this a takeaway in and of itself?” Those are the things we bold. 42:20 Laci: We do use pull quotes, but these aren’t the same as pull quotes that you might see in a magazine, where a sentence or quote is pulled from the actual text. We try not to repeat content, so the pull quote is a short summary or a gold nugget. Any headlines, bolded text or pull quotes are takeaways that can stand alone. 45:23 We also use switch between italics and regular text to indicate which person is talking at the moment. 45:47 Sean: I started doing that so the reader could immediately tell who was talking without having to look back and check for their name. 52:35 Aaron: Writing extensive show notes also shows my potential clients that I’m familiar with these subjects. No matter what your niche is, if you’re recording podcasts and writing show notes about topics, that demonstrates that you know what you’re talking about and it makes you an authority on that topic. 53:28 Sean: If you want to make a name for yourself, write daily. That’s how people see if you’re an authority; they look at your website to see what you’ve written about a certain topic. 54:23 Aaron: You’ll also learn more about a topic by preparing an outline and writing show notes. If you start with the mindset of providing value, then you have to go out and learn and share that knowledge. 1:01:41 Cory Miller asks: Should I invest in dictation software to help with show notes? 1:02:19 Laci: We tried using dictation software, but I stopped using it after two or three months. It was only about 50% accurate, so it was taking me more time to fix the mistakes than it would have if I wrote the words out myself. So depending on how fast you type, it might end up being faster to just do it yourself. 1:04:34 Aaron: I have a question. I’ve thought about hiring a transcriptionist to do a transcript of my episode which I could then turn into more detailed show notes. Have you explored that option? 1:05:00 Sean: I would like to hire someone dedicated to doing show notes. Even if we hired a transcriptionist, there’s still a lot more work that needs to be done; headers, block quotes, etc… I’m not saying it wouldn’t be worth it for a lot of people, but it’s not the right solution for us right now.